UPDATE: When this journal started, I set out to write three books in a month. On Day 4, I decided this trilogy should instead be consolidated into a single book, Overlap, containing all three parts. Days 1–3 have me talking about the three parts as separate books, but I have left things unedited for archival purposes. You can continue reading the story as it happened, or skip to the journal entry on Day 4 to read what happened. 8 months ago, I decided I was going to write 3 books in a month. Today was the first day of my quest. It was strangest thing… I write between one and two million words a year now, but for some reason I was just really apprehensive about getting started on these books. I was excited, but still nervous. Sure, I hadn’t written a book before and I decided to write three in a month (which might have something to do with it), but I have everything it takes, right? Why was I anxious? I spent the first 30 minutes setting up Project Targets in Scrivener (that’s the writing app I’m using). They look cool and it was definitely a huge motivator—I’m really glad I did it. But if I’m being honest, I was just looking for an excuse to procrastinate. I didn’t need to setup fancy targets, I just needed to write. I was looking for any excuse not to start. Why was I so anxious? I made a silly beginner mistake. It’s obvious in retrospect. I knew the order in which I needed to write the book and naturally, I started at the beginning. Well, that was exactly what caused me to waste the first 30 minutes. By starting at the beginning, I knew the first words I wrote on the page would, in theory, be the first words someone would read in the book. Not just any book, my first book. It was silly, but it was enough to mess with me. I decided to start by writing the wrong words. “These will definitely be cut out,” I told myself. That was good enough as I had no problems from that point on. Tip: Don’t start writing the beginning of your book. Start in the middle, or at least Chapter 2. I Didn’t Ramble. I Wrote Exactly What I Wanted to Say. My plan to write from 6am–8:30am. I did. I wrote 2,310 words by that point and spent 10 minutes eating breakfast. It didn’t help that I was distracted by tweaking Scrivener features for the first half hour, but even then, that rate felt really slow. It was little more than a thousand words an hour. I was expecting to really be cranking out the words at a rate of at least a couple thousand words an hour. I spent most of my time staring at the page. 10 hours just to get 9,507 words? I wasn’t too happy with that. I had this idea in my mind from hearing other people talk about writing books. They said the process was to first dump out your thoughts into a messy pile. Then go back and edit, edit, edit. For some reason, even though that did not reflect my process at all, I expected that it must be that way if that’s what people said. I just assumed it was right. But it wasn’t. Not at all. I think it’s because I’m very practiced and I know my message. I found that I wrote exactly what I wanted to say and said it how I meant it. I was definitely doing some editing as I went, and I’m sure that slowed me down some, but I feel extremely good about what I wrote. I feel like it’s 95% final draft. I’d be comfortable handing what I’ve written off to someone right now. It doesn’t even really need much structural editing (I’m used to writing courses). Mostly just fixing a myriad of grammatical errors. Something I just realized is that I have a tremendous amount of practice working with editors just within my team. I write courses, email newsletters, autoresponders, website copy, blog posts, and podcast outlines and I have show note writers on my team who help proof and edit my writing. I should have thought of it sooner: I already have practice writing almost-final copy and relying on an editor to clean up mistakes. Remembering that puts me at ease. I only just now realized it as I was writing. Chalk one up for journaling! People asked me how I could possibly write three good books in a month. I wrote nearly 10,000 words just today and I spent most of my time staring! It’s far from impossible to write three, 80,000-word books in a month. It’s just discipline. We waste most of our time. Let me rephrase that and speak for myself: I waste most of my time. To write a book, you need writing skills, sure. You have to have a message, yes. But it’s 90% mental. Your ability to write a book is equal to your ability to focus. Focus is one of the hardest things to do. We crave distractions because they free us from deep thinking and intellectual work. Step one is to have three books in your head. I’ve done that. I’ve spent thousands of hours and done hundreds of episodes talking about these concepts. It’s just a matter of transposing from my mind to paper. You can write three books in a month if you put your mind to it. You can do anything if you put your mind to it. That’s what a teacher told me in third grade and I believe it. If you agree with me or disagree with me, you’re right. 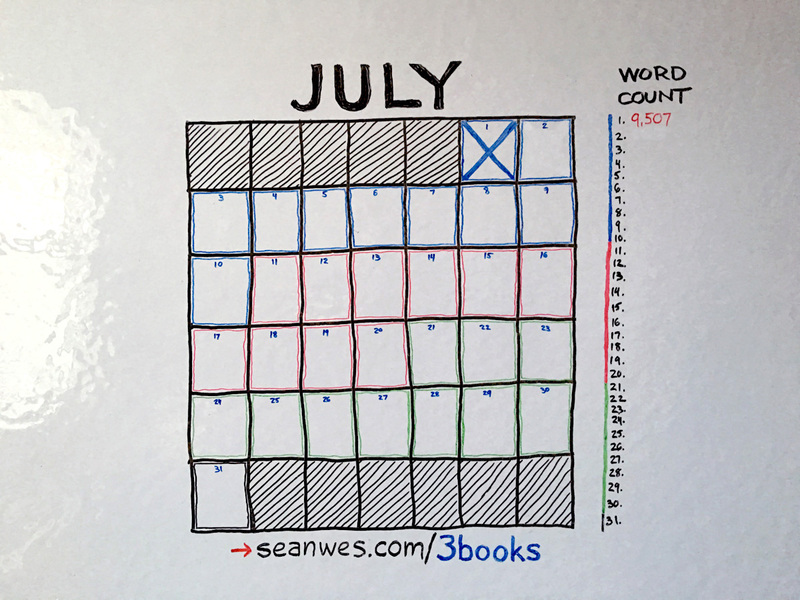 If I set out to write one book in three months, that’s how long it would take. If I set out to write three books in three years, that’s how long it would take. I’ve found that everything I’ve done in my life has taken exactly as long as the amount of time I gave it. If you’re going to set a goal, why not set a big goal? Who Are You Writing This Book For? Starting was hard for a few reasons. Once I figured them out, it was much easier. I already told you one reason. Here’s another: I should have been thinking about the person I’m writing this book for. When I started picturing that person as I wrote, suddenly it all became clear. CONTROL + COMMAND + D will display the definition of the selected word. By opening the Dictionary.app and going to Preferences, you can also drag the rearrange the reference sources in your preferred order. I put the Thesaurus on top because I want to use CONTROL + COMMAND + D to give me alternates for the last word I wrote. I’ve been going for almost 18 hours. I really think I can hit my daily word goal by 3pm if I’m disciplined and waste less time. You don’t have to work 18-hour days for 30 days to write three books in a month. You just need focus. I want to prove that to myself this month. Part of that time after 5pm was setting up the live stream. Did you catch the video at the top of this post? I also live streamed a breakdown of my day and shared some of my thoughts. What did you think? If you enjoyed it I’ll keep doing those too. My right wrist hurts a little bit. I hope that’s not a problem. I can always dictate though. No excuses. Step one: have three books in your head. Starting is hard. Do hard things. Start. Focus is one of the hardest things to do. We crave distractions because they free us from deep thinking and intellectual work. I was thinking at first that sharing this journey was interesting because I was writing three books in a month (which, by the way, I got the domain 3booksinamonth.com so it’s easier for you to remember). But then I realized, few people share the book-writing process at all. So I like to think this is something special. I hope it’s interesting to you.